Every year, my dog is my valentine. I love making special DIY Valentine’s Day Dog Treats for my dogs. 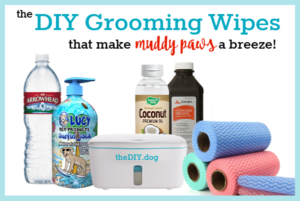 Homemade dog treats are such a lovely way to spoil your dog and Valentine’s Day is the perfect time to do it. Whether you’re making a quick treat for your own dog or you want to surprise neighbourhood dog friends, this chicken dog treat recipe is quick, easy and Kolchak loved them. We made these treats with chicken, but honestly! You could really make them with any kind of lean meat. If your dog has allergies, try substituting a novel protein like bison or quail. These quick and easy heart shaped chicken dog treats are a simple way to spoil the special doggo in your life. Mix together all ingredients and stir well. Bake for 20 - 30 minutes, until tops are golden brown. Allow to cool and remove from molds. Not feeling up to baking? I hear you! The good news is that most dogs don’t really care if you bake – they just want snack. 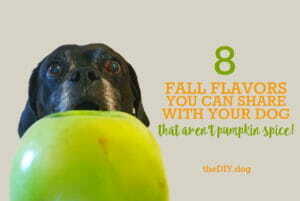 The frozen chicken dog treats are even EASIER and just as delicious. 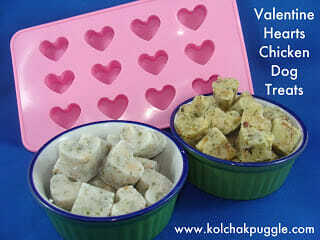 These frozen chicken dog treats are a quick, easy and healthy way to spoil your furry Valentine. In a blender or food processor, blend together all ingredients. Place in freezer until solid.